Lawmakers in Kosovo voted unanimously in favor of a set of laws that would allow their nation to create an army on Friday, but opposition Serb politicians boycotted the vote in protest. 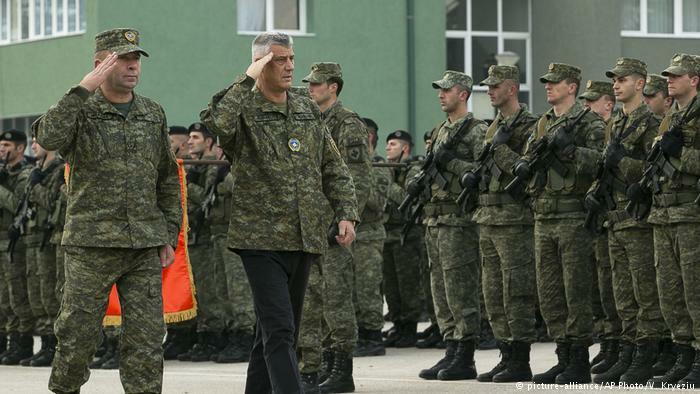 "The creation of the Kosovo army is the result of a century of sacrifice," wrote Kosovo's president, Hashim Thaci, on Twitter. On Facebook, Albanian President Ilir Meta called the creation of the Republic of Kosovo's army a "historic decision." Meta said it shows that Kosovo "is capable of taking on new responsibilities regarding the creation of democratic institutions, contributing to peace and stability in the region." A former Serbian province, Kosovo separated from Belgrade during the 1998-99 Balkan war and unilaterally declared independence in 2008. Serbia is one of the countries that has not yet recognized Kosovo as a nation, as well as Russia. In response to the vote, Serbian Prime Minister Ana Brnabic said her country would "stay on its path of peace and prosperity." "For me this is a hard day, not a day that contributes to cooperation in the region," she added. Nevertheless, Serbia has suggested a range of possible reactions to the move, including an armed intervention, which Brnabic says is "one of the options on the table." Speaking to DW Phil Gayle, Serbia's ambassador to Germany Dusan Crnogorcevic did not specify what kind of threat would prompt a miltiary response from Serbia. "We are extremely worried in Serbia that the kind of miltiary muscle that [the Kosovo authorities] want to show will have a negative impact on the Serbian population in Kosovo," Crnogorcevic told DW TV. Earlier on Friday, Foreign Minister Ivica Dacic said Friday that Serbia will seek a special meeting of the UN Security Council to deal with the issue, which Belgrade says is a clear violation of the UN resolution that ended Kosovo's war of independence in 1999. The new law would create a new defense ministry and lays out a plan to double the size of its current small crisis-response unit, the Kosovo Security Force (KSF), to gradually transform it into a professional army of 5,000. "The process of transforming the Kosovo Security Force (KSF) began 10 years ago under the instructions and assistance of our NATO partners," Kosovo Prime Minister Ramush Haradinaj said about the vote. "We are at a point where it is a logically necessary step," he said. NATO, which has kept a peacekeeping mission in Kosovo since the war, warned that the move was "ill-timed," given the small nation's poor relationship with Serbia. Four members of the alliance reject recognizing Kosovo's independence. As the new laws were approved, Secretary General Jens Stoltenberg said on Twitter that he "regretted" the decision and that "all sides must ensure" that it will "not further increase tensions in the region." But the US and the UK have favored the move. US ambassador to Kosovo, Philip Kosnett, celebrated the vote on Twitter, saying the KSF's transition was historic. "The US will support the professional development & organizational evolution of KSF, which must play a positive role for Kosovo & the region," Kosnett wrote. Thomas Silberhorn, a conservative lawmaker with Bavaria's CSU who serves in the defense ministry, told DW that the German government viewed a new Kosovar army with caution. He added that, generally, Germany would support the transition process of the Kosovar security forces, but that Pristina should stay away from outright labeling them "armed forces," given the country's delicate political situation. "Kosovo is not recognized by everyone, this is disputed issue," Silberhorn said. Peter Beyer, Christian Democratic Union lawmaker and member of the foreign affairs committee of the Bundestag, told DW that he understood Kosovo's wishes to have an army as a matter of "national pride." Beyer noted "we're not talking about tens of thousands of troops" and emphasized that the new law would trigger a long process of developing the Kosovar security forces. Predictably, Kosovo's army plan has drawn the ire of Belgrade. Serbian President Aleksandar Vucic said on Thursday that the Kosovo problem was his "worst nightmare." Vucic accused Pristina of "beating war drums" and threatening the minority Serb population. Serbia still considers its former province a renegade territory and has sounded the alarm over the safety of 120,000 Serbian minority still living in Kosovo, most of whom reside in the north near the Serbian border. Kosovo's population is more than 90 percent ethnic Albanian. Kosovo's prime minister, Ramush Haradinaj, sought to allay such fears by noting on Twitter: "This army belongs to all, we will always stand for freedom. The army will never be used against our own people — whether in the south, in the north, or here at home, the Kosovo army will never be used against them."